Sony is restricting access to certain online features in Gran Turismo 5 while it tries to get everyone's cars back up to speed. A smooth ride in Gran Turismo 5 may involve the switching off of routers or the yanking of Ethernet cables, as Sony has warned that anyone playing the game with their PS3 hooked up to the internet might be in for a less-than-perfect experience. GT5 is currently experiencing "extreme online traffic congestion." This isn't that an unusual for a highly anticipated, high-profile game so soon after its launch, but because the game accesses the servers on menus and in various screen displays in GT Mode, it's slowing down the single player game as well. In order to help alleviate the problem, Sony has prevented the viewing of user logs, and in some cases, prevented changes to user profiles or friends lists. While it works towards a more long-term solution, Sony is recommending that people disconnect their PS3s from the internet and play in offline mode. 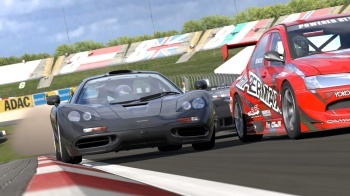 Sony and Polyphony Digital clearly underestimated how much of a workout the GT5 servers would get, but hopefully the situation can be resolved quickly. It's a shame it's intruding on the single player game as well, but there is at least a solution for that problem - as rough and ready as it may be. Online gaming might seem commonplace, but in reality it's still new ground for a lot of game makers, who have likely barely thought about online elements in single player games before. This doesn't excuse the problems that GT5 players are experiencing, but you can at least understand why they're happening. It seems pretty likely that we'll see this problem a few more times from various titles, as developers and publishers fine tune how they weave online elements into their games, but with any luck, the problems will be few and far between.